UUCLV Interweave, a special committee of the Unitarian Universalist Congregation of Las Vegas, is dedicated to the spiritual, political and social well-being of those who are confronting oppression as bisexual, gay, lesbian, transgender and/or queer, and their heterosexual allies. Interweave affirms and promotes the full participation of all persons in all our activities and endeavors without regard to race, color, gender identity, physical or mental challenge, affectional or sexual orientation, age, socio-economic status or national origin. In February of 1997, seven members of UUCLV attended the Interweave Continental Convocation, “Convo”, in San Diego. The training they received regarding becoming a"Welcoming Congregation" was the impetus to charter a group here at UUCLV. They presented the Welcoming Congregation Workshop series, that summer. In September of 1997 our congregation voted unanimously to become a "Welcoming Congregation". This involved, among other things, changing the language of UUCLV's mission/vision statements and our by-laws to be inclusive of BGLTQ terms. 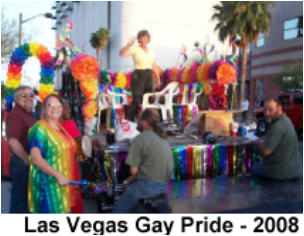 Every year since its inception, Interweave has participated in Gay Pride with either a booth at the Festival, an entry in the Parade, or both. We have hosted several fundraisers and social events. Each year we sponsor at least one Sunday worship service. Past guest speakers include the Rev. Jonalu Johnstone, President of Interweave Continental, Rev. Barb Greve and Marc Adams, founder of Heartstrong. ​In 2015 our own Theo Small and Antioco Carrillo shared with our Congregation their journey from being one of the 8 couples challenging the law preventing same gender couples from marrying in Nevada to being the first same gender couple in Clark County to be awarded a marriage license.